There are occasions when you may not be willing to carry a man made shelter. Sometimes it is fun to build a natural shelter. In a survival situation you may have no choice but to construct a natural shelter. It is not a decision that should be made lightly. Before choosing to make a shelter you have to consider the conditions and the availability of resources. It maybe better to use your remaining energy to reach civilisation rather than spend an uncertain night in a poorly made shelter. If the conditions are such that you need to build a shelter then you must consider which elements are causing you the most problems. If the temperature is low with no wind and you can have a fire. No shelter and a long log fire could well be a better choice than building an elaborate shelter. In the UK the wind chill accompanied by the wet is going to cause most problems. Therefore getting into a bothy bag, out of the elements, and sitting it out is probably a good idea. When choosing a site for you shelter you must consider the wind direction. In the UK the prevailing wind comes from the south west. Do not site your shelter with the back to the wind. The wind will eddy over the top of the shelter drawing air and smoke into the shelter. If building a shelter in woodland always check the surrounding trees for dead falls. In summer it would be wise to avoid Larch and Beech trees. These trees tend to drop large branches with little warning. A riverbank can a poor choice of camp site as heavy rains may result in a flash flood. Riverbanks are also natural pathways used by animals and people. Try to avoid disturbing other forest dwellers. Pools of standing water attract insects, which can lead to a miserable night. Avoid obvious animal tracks especially in bear country etc. It is hard to beat the feeling of contentment when settling down to watch the setting sun, in front of a fire, by your natural shelter than you have constructed. There are several designs of debris shelter depending o the conditions and the available resources. If materials are plentiful and you are planning to have a semi permanent camp then why not build a large group shelter. However if time is pressing it may be better to build several small shelters rather than one large beast. The most important parts of a lean to debris shelter are the two forked rakers and the ridge pole. Once these have been located the side walls can be built using any timbers to hand. Do not allow the timbers to stick up beyond the ridge pole. Water will use this a fast route inside to make your night miserable. Once a good lattice of sticks has been added to each side, then a thick thatch of leaf litter can be added. Another natural shelter often cited for use in an emergency is that of the snow hole. Having built snow holes in cold but good conditions I would not want to have to make one in an emergency. 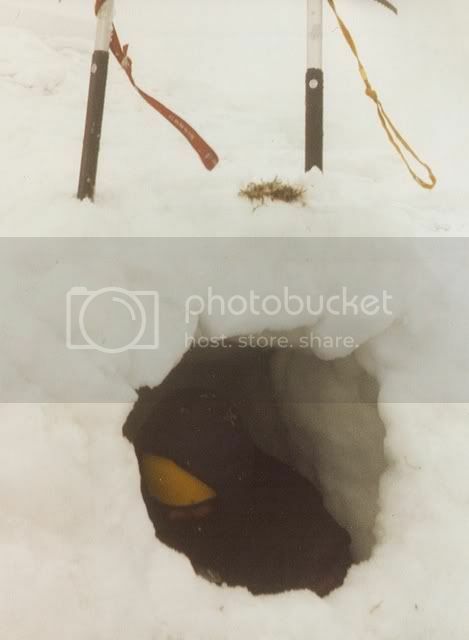 It takes a lot of time and energy to dig a shelter using an ice axe alone. High winds and blizzards can make using a tent in deep snow difficult. It is important to know how to make a shelter in the snow. Snow is an excellent insulator and makes a great home. I spent a week using a shelter as a base for winter climbing. It was great to come back to and very cosy. Cold weather shelters can range from simple trenches covered with a few pine boughs to the famous igloo. A simple windbreak can be built to shelter behind during a lunch break. The snow cave. A trench should be dug into a snow bank. As deep as possible but at least 2m. Snow banks are often found on the lee side of bowls and beside riverbanks. 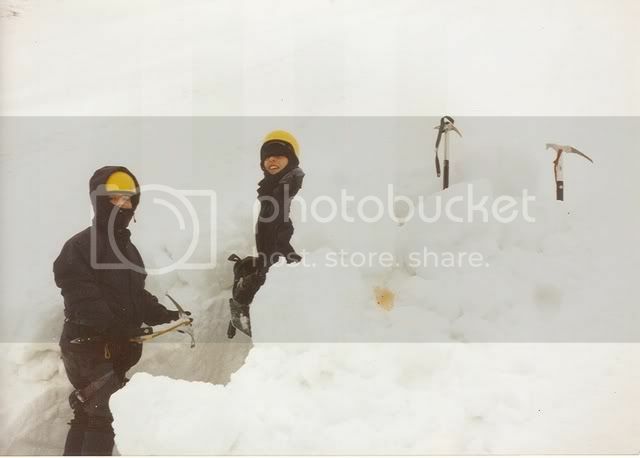 Before starting to dig a shelter assess the site for any object dangers like avalanche or Serac collapse. A few hundred tons of snow and ice falling on your shelter will spoil your day. When digging your shelter it is advisable to remove your mid layer and just wear your waterproof outer layer, digging it very hot work and a wet mid layer will be difficult to dry. 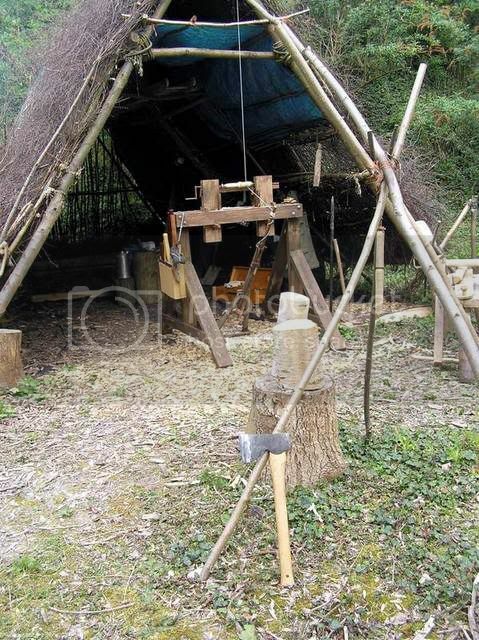 Ensure a pole or axe shaft is driven up through the roof to keep proper ventilation. Keep the roof a smooth as possible to prevent drips. Remember when conditions are poor the simple solution is nearly always the best choice.